The CDH23 and CDH27 have been discontinued. Please see the CDH220 series as a possible alternative or contact our sales department. The CDH-23 and CDH-27 are simple-to-operate, battery powered portable meters which indicate conductivity on a stable, easy-to-read analog display, designed and calibrated specifically for monitoring water quality. 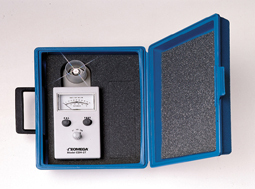 These handheld meters feature integral sample cup sensors, water and chemically resistant ABS cases, and rubber booted switches. The CDH-23 and CDH-27 display conductivity in both Micromhos and Parts Per Million and feature automatic temperature compensation. The economical CDH-23 is ideal for measuring the performance of reverse osmosis and other drinking water filtration systems with a single range of 0-1200 PPM. The CDH-27 displays conductivity across three switchable ranges of 0-50, 0-500, and 0-5000, providing improved accuracy and readability. 참고: Units come with a complete operator's manual.